Some customers do not have access to the Microsoft store. 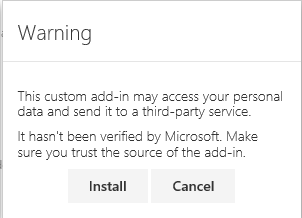 If you are unable to install our App from the Microsoft store you may follow the instructions here to install it (bypassing the store is called 'side loading'). The app can be sideloaded from OWA (your browser) or form Outlook desktop. These instructions are borrowed from Microsoft. We recommend side loading as a last resort since certain updates to the app will not be available to you. 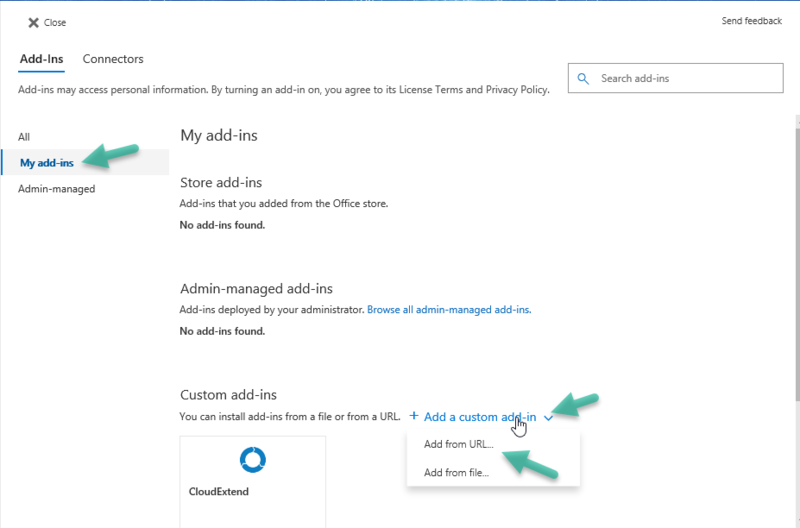 Here are the steps to side load CloudExtend Outlook Add-in using your web browser. Step 4: Clicking on Add from URL will open one more popup as shown below . Step 5: You will now get a warning as shown below. Click Install to continue. Step 6: Once the installation is complete, close the popup and you are now ready to use CloudExtend Outlook. Step 1: Open Outlook 2013 or later for Windows, or Outlook 2016 or later for Mac and select the Get Add-ins button on the ribbon. Note If you don't see the Get Add-ins button in your version of Outlook, select the Store button on the ribbon instead. Step 2: Select Add-Ins, and then select My add-ins. Step 3: Locate the Custom add-ins section at the bottom of the dialog. Select the Add a custom add-in link, and then select Add from file.